Welcome to my blog. 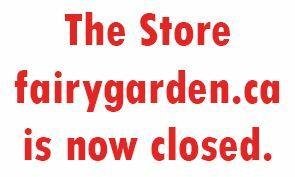 I am the previous owner of fairygarden.ca, a Canadian online store for fairy garden and other miniature garden enthusiasts. I live in Kingsville Ontario on the shores of Lake Erie in a little fairy house like cottage nestled in ivy. It's easy to imagine fairies scuttling among the ivy and ancient trees and rocks around the place. It’s that time of year here in ‘ the great white north’ when fairy gardening moves inside to potted arrangements. 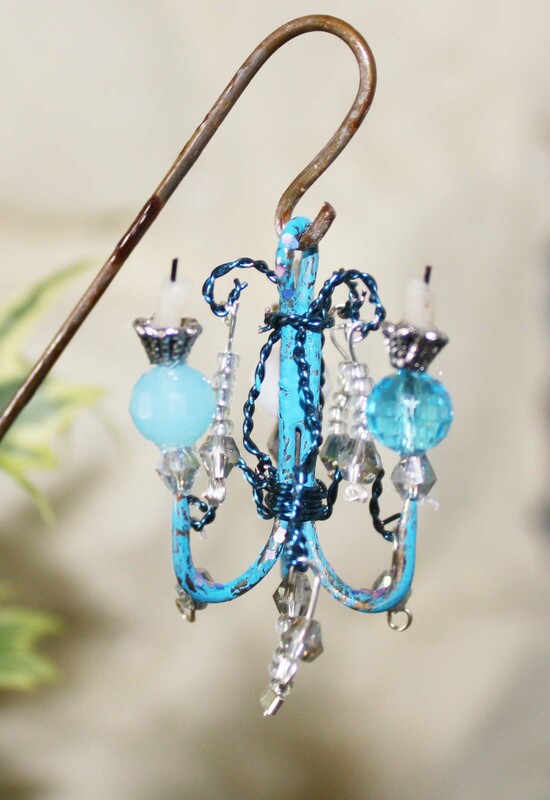 It’s easy, fun and funky to decorate for the season with seasonal accessories and DIY items. Using my favorite polymer shape-and-bake clay (Primo Sculpey) I cooked up a few ghostly friends for my display. Not into clay? The tiny jack-o-lantern with the green leaf ‘do’ is fashioned from a small rock, a bit of craft paint and a pinch of plastic greenery form a dollar store find. You could use small stones and rocks to paint up some ghostly friends as well. I use Outdoor Patio Paint by DecoArt to make my painted items impervious to water for my planter gardens. Tiny jack–o -lanterns from the store are displayed as a group with faces turned to the back to make my little pumpkin patch. 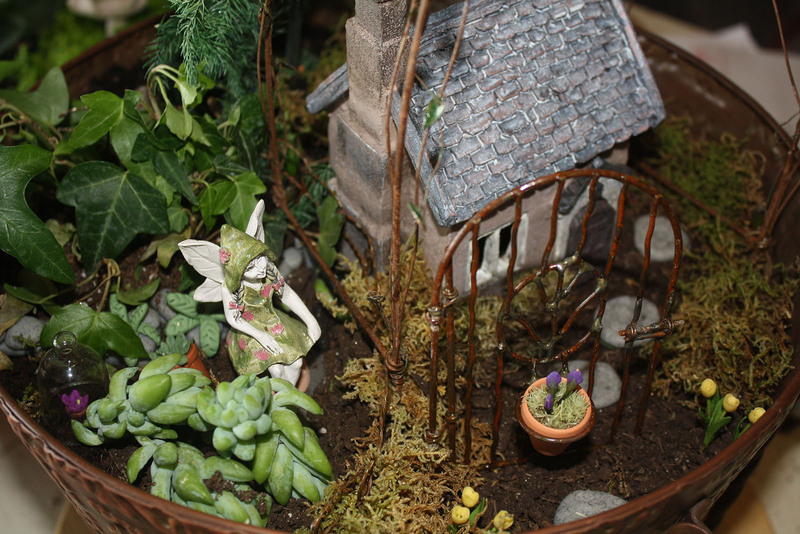 Other items – the witch on a broom stick, the skeletal remains and the Acorn Tree House are also items available online in the store (fairygarden.ca). Even if you are not into spooky – a nice harvest themed display without the scary stuff is great too! Perhaps as a center piece for your Thanksgiving dinner. Wow. 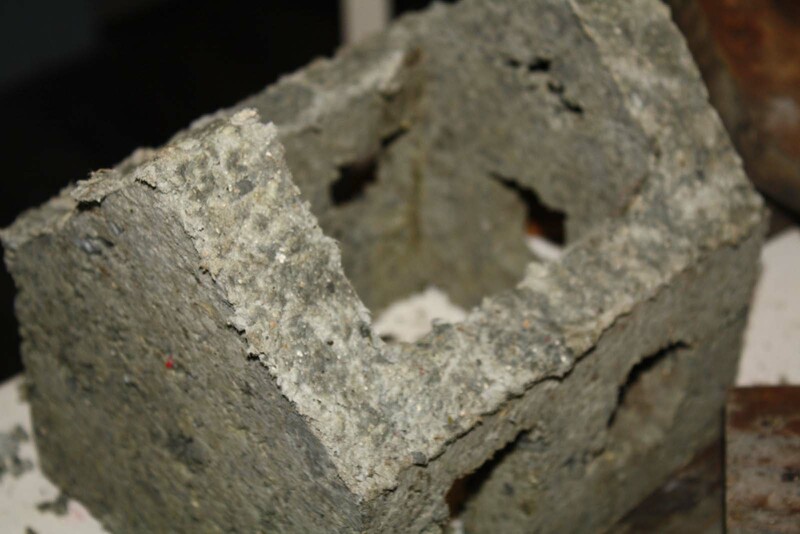 Many of you may have heard of hypertufa, a mixture comprised usually of perlite, sand, peat moss and portland cement. Used first by alpine gardeners to emulate the natural tufa rock often associated with alpine plants (plants that grow above the treeline), the hypertufa mixture is used to free form artificial rock or in forms to produce gardening containers. It has a very beautiful and natural look and the peat moss and pearlite make them light weight. It has, in my opinion, three draw backs. It’s mucky to work with and it needs to be cured (dried) and leached out in water or rain for several weeks before use. In cold climates it also has a tendency to crack or deteriorate over the winter if left out doors. Enter papercrete! Papercrete is a mixture of paper pulp, perlite or vermiculite, and portland cement. Fillers such as sand are optional to produce different effects and textures. 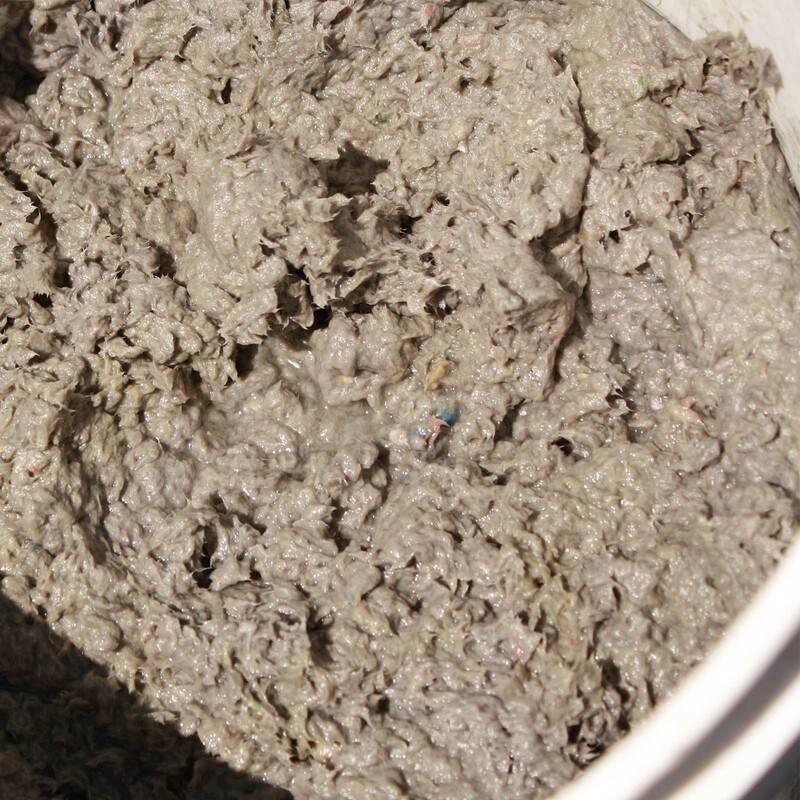 The paper pulp is produced by shredding any used paper you have, soaking it for a day or two in water and then pulping it with a paint mixer attachment on a drill. Lee Coates, papercreter extraordinaire, says various papers produce unique results but his preference is good old newspaper as it is readily available in large quantities, it has a long fiber for strength and is easy to shred and pulp . Newspaper and water pulped into an ‘oatmeal’ consistency. How does it hold up? 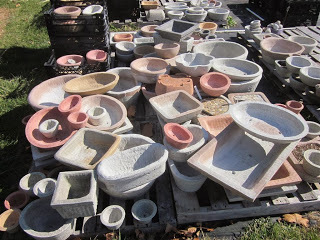 From Lee Coates’ Papercrete Blog : The most frequently asked question is, “How do they hold up in the water?” After shoppers find that paper is one of the ingredients in the recipe of our product I find that it is a fair question. 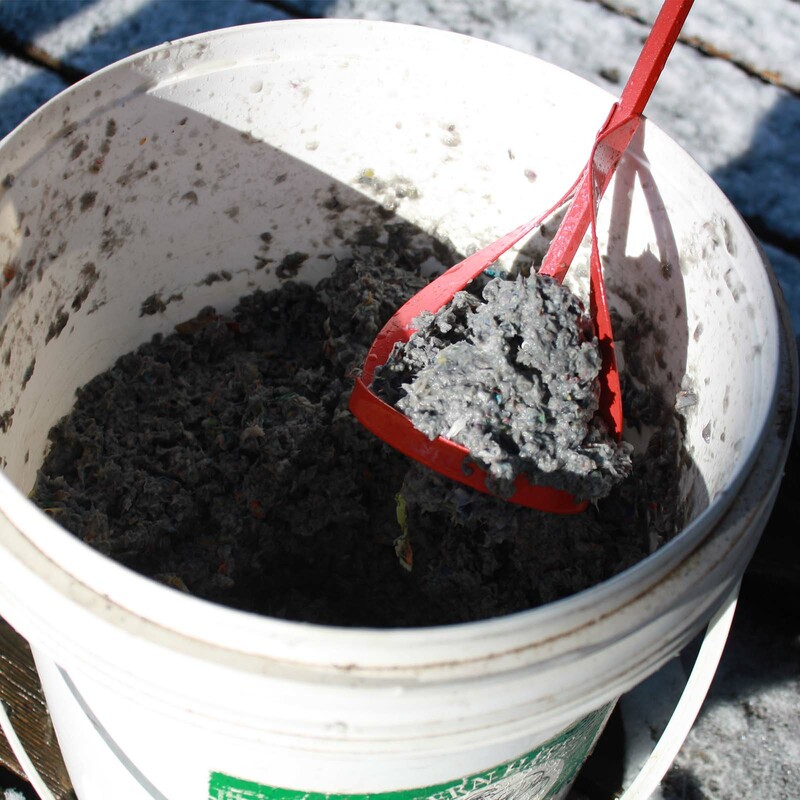 The paper is just a fiber source that is encased by portland cement… I cannot say how long the product will hold up but we have had some of the pots in ground contact for several years without any deterioration. What we build each year once dry gets placed outside on pallets to suffer whatever Mother Nature throws at them. Containers built in the Fall are built for sale the following year so they are subjected to rain, snow, sleet, hail, and ice throughout the Winter. How do they hold up? About the same as the sidewalk in front of the house! The basic recipe for papercrete is approximately 3 parts paper pulp, 2 parts portland cement and 1 part perlite and other optional fillers. Getting the paperpulp made to the right consistency is key. Too wet and the mixture is slumpy and if too dry – crumbly. Make small batches to experiment and get your mixture to your liking. To make containers you can use anything fairly smooth coated with a bit of vegetable oil to allow easy release. Ideally, the container should be shaped in a somewhat tapering shape in such a way as to make the finished product easy to remove once dry. 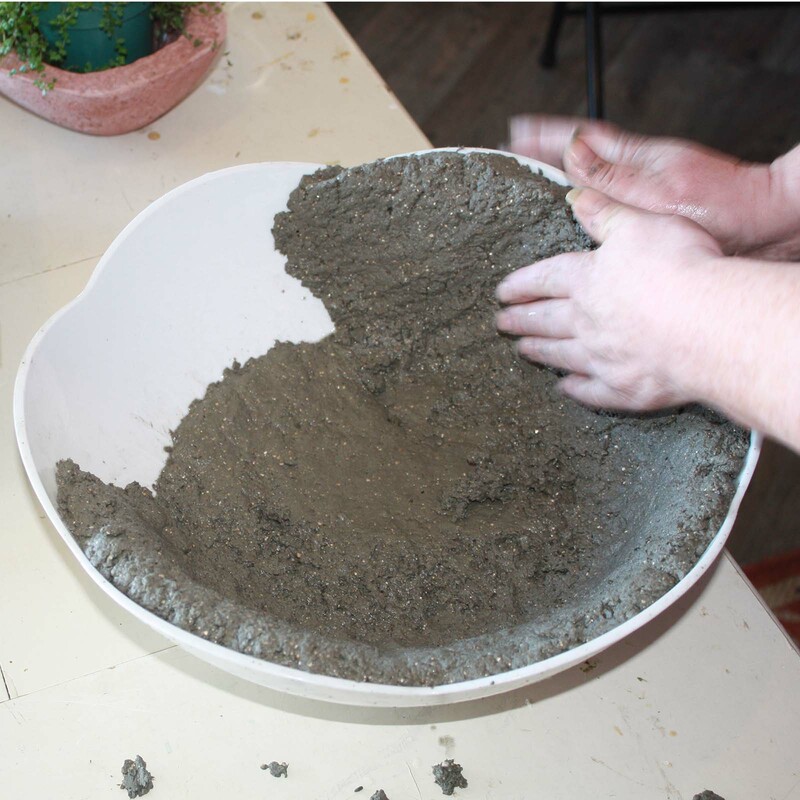 For an 18″ container the thickness of the papercrete should be about 3/4″. Just take handfulls of your mixture and hand form it and pat it to compact it into your mold of choice. Allow it to dry for 24 to 48 hours and remove from mold. Drainage hole can be made during by finger poking or after with a drill. Newly released from their molds after 24 hours these containers were purposely made and left with rough top edges. Papercrete can easily be sanded, drilled, and sawed after it is thoroughly dry. Cement dyes can be used to color it or thinned paint can be used to stain it afterwards. Adding a small amount of latex paint during mixing adds even more durability and resiliency to the end product and also acts to neutralize alkalinity. When can you use it. Right away! 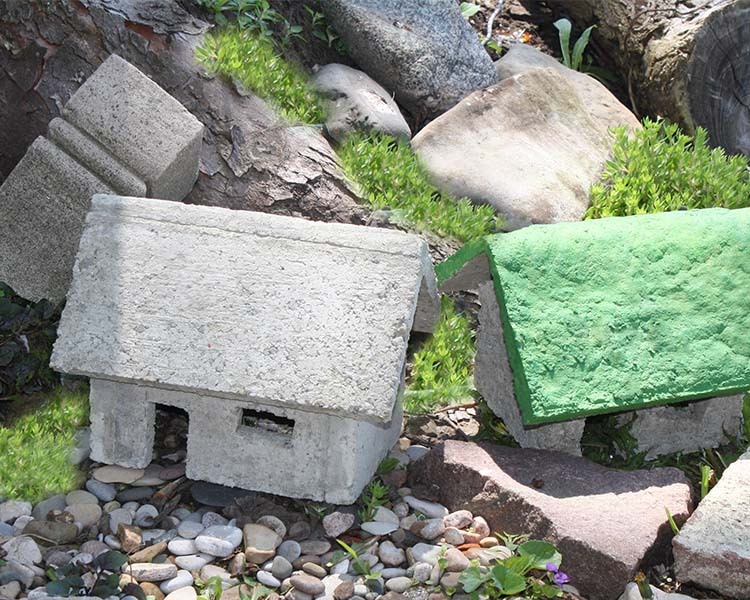 Papercrete can also be used to make fairy houses and in some places in the United States it is being used in large scale projects to build real houses! An experiment of my own using a one part mold for the house and a one part mold for the roof of a papercrete fairy house needs some refinement although the basic idea seems to work. 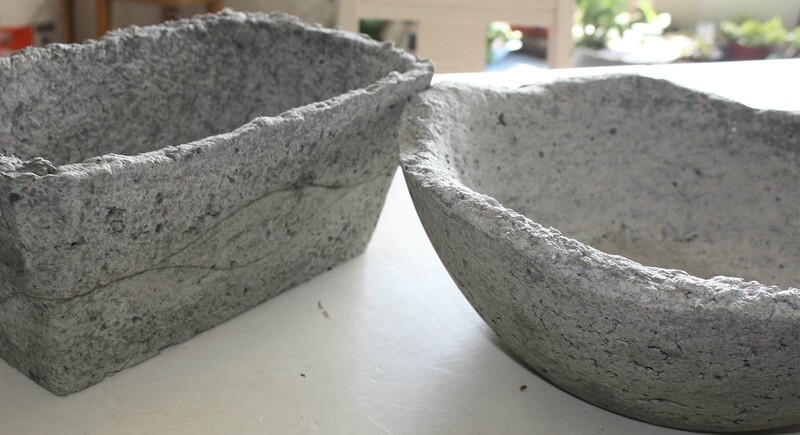 In the final analysis, having played with both hypertufa and papercrete I find several advantages to papercrete. First it’s ‘greener’- I love the idea that it uses a resource that would otherwise be filling our landfills. It is also so clean and easy to work with , can be used right away, and appears to stand up well to freeze and thaw conditions. 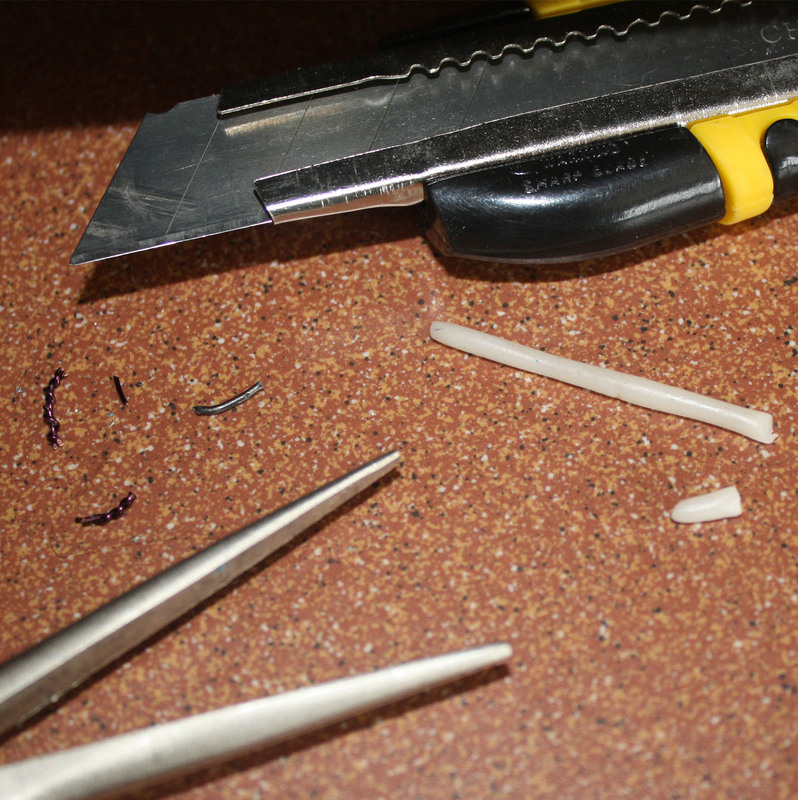 It’s versatile – it can be easily cut, drilled, sanded, colored , screwed and glued! What more could you want? 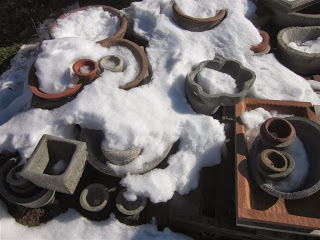 Many thanks to Lee Coates for introducing me to the wonderful world of papercrete and allowing me to use information and pictures from his blog. The instructions and care tag for this plant should be ……”provide unrelenting abuse”. I am ashamed to admit that I am not the best plant nurturer around, but this time I’ve out done myself. While shopping for a few plants to use in display gardens for a show I impulsively grabbed a few interesting things called air plants. I believe they were $1.50 each . 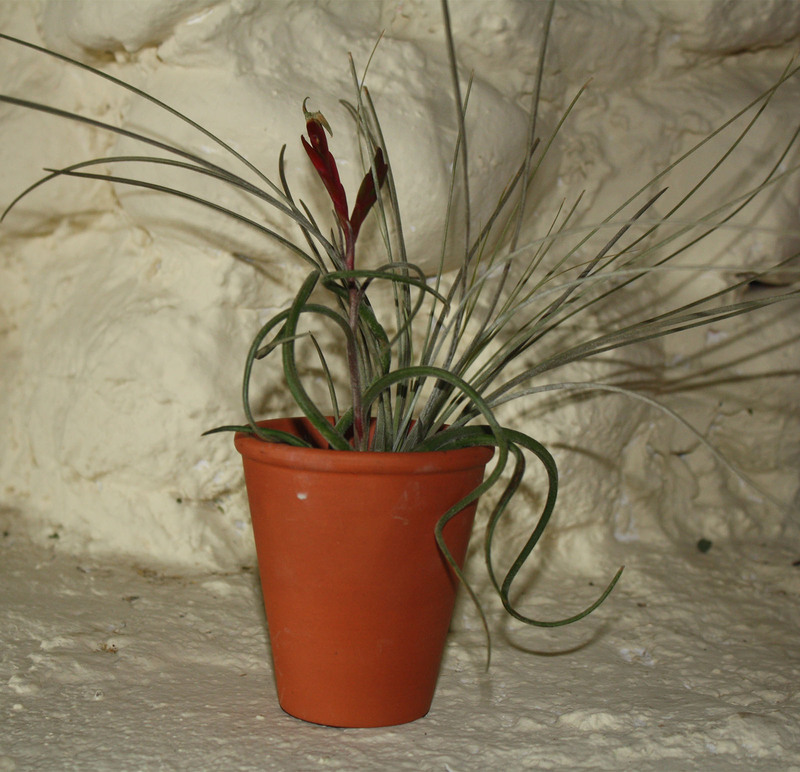 I went home armed with all the information I had about these plants which was..they were called air plants at the nursery and they had been displayed laying about on a screen. I deduced that soil was undesirable. 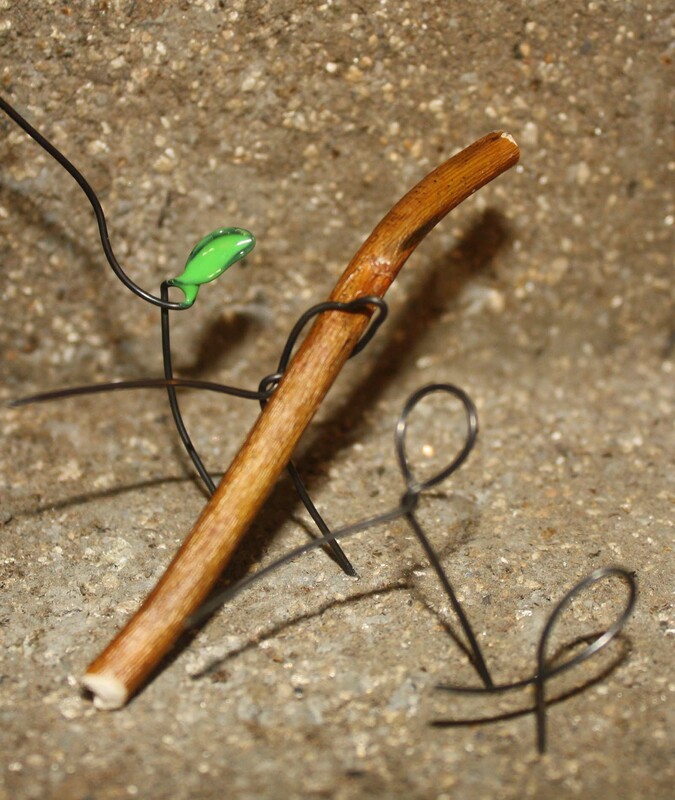 I loosely wrapped a bit of thin wire around them and ‘picked’ them into a sandy area of an arid fairy garden display for the show. And away we went out into the snow storm to the show. After the show I didn’t see the air plants in the bottom of the box I was unpacking and they were stowed into the attic in the empty box for about 2 weeks . When I next discovered them I brought them downstairs and just popped them into a small empty clay pot so they would stand up. Next thing I knew the cat had them! I rescued one immediately but the cat was on to me and dashed up the stairs into an inaccessible crawl space under the eaves. For several days I could sometimes hear the cat playing with plant. This involved biting it, tossing it in the air, batting it around up and down the stairs etc. All the usual cat nonsense. Finally, I did get my hands on the poor abused plant, popped it back in the clay pot and down graded the abuse to simply ignoring it completely. I couldn’t really tell if it was alive or not. It looked about the same as when I had last seen it…I’m not even sure how long ago that was, but today I noticed that it is growing and starting to flower! I fully intend to rectify my complete ignorance about this plant. What do you know about these marvels? As always keep having a fairy good time …and hello, welcome and thank you to all my new followers. Feel free to shoot me a line. 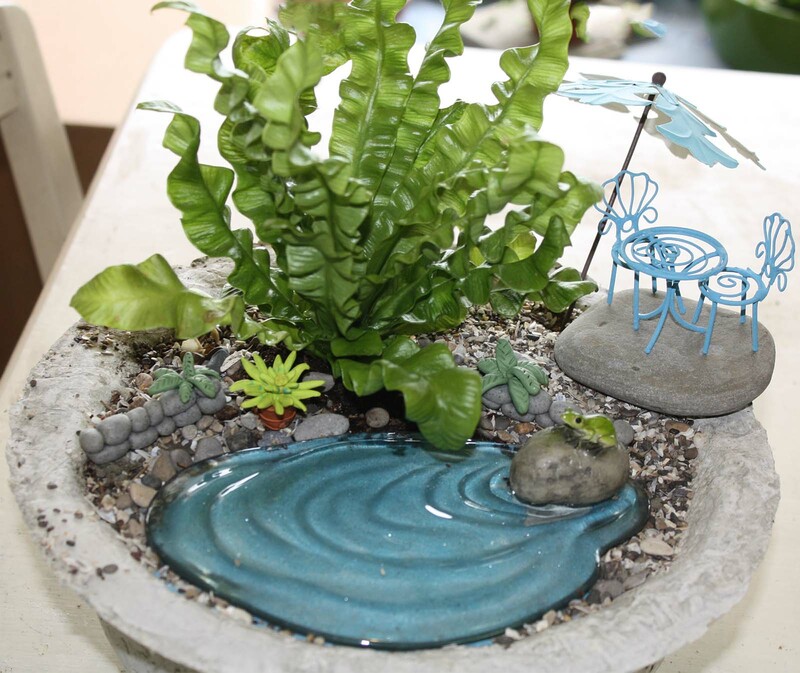 Always happy to hear what others are doing in the fairy garden and miniature garden DIY world. Never fear to experiment. After all, what’s the worst thing that can happen? Maybe a less than satisfactory result. 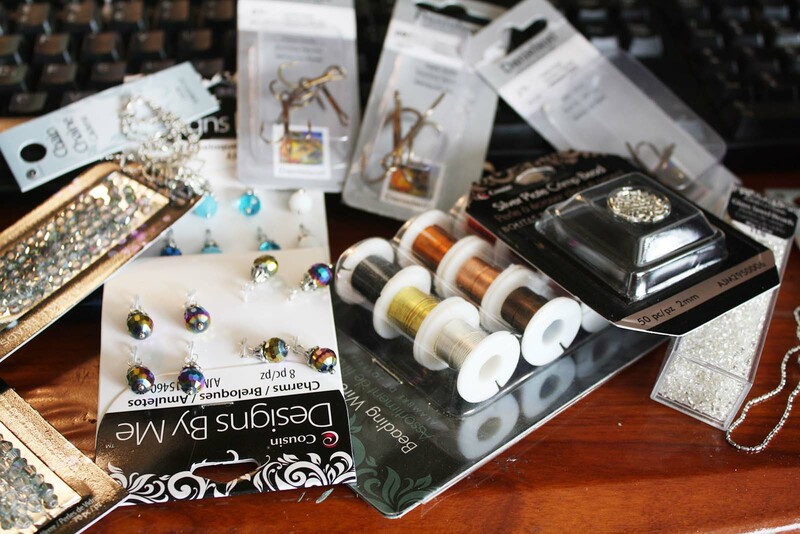 Even then, chances are you will have learned something from your effort that can be used to improve on the present experiment or be useful to another craft project. Like most of my ideas, I borrowed this one and adapted it to my purposes. 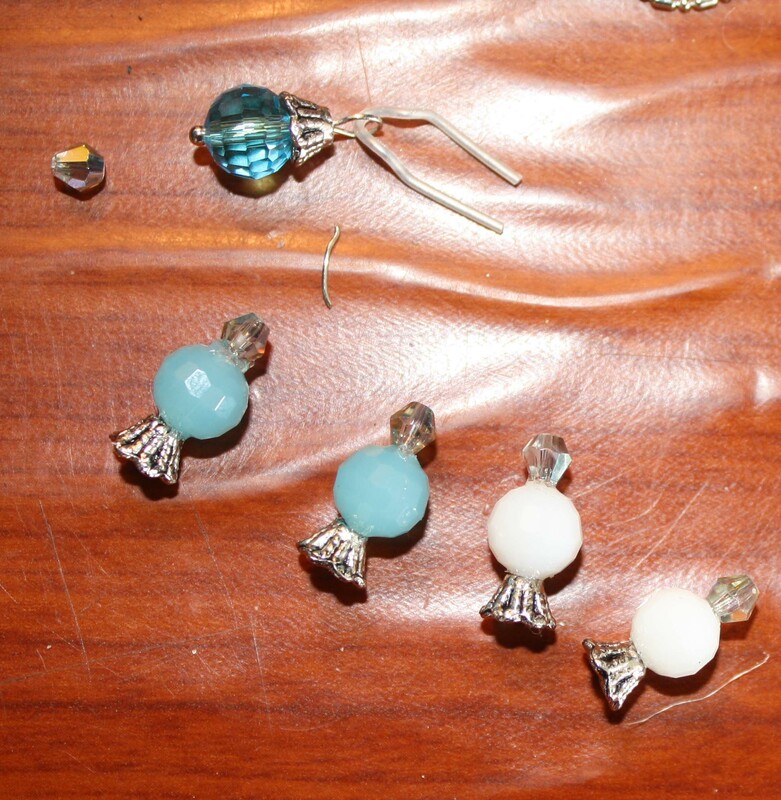 I saw a Pin displaying twisted wire flower crafts for making wearable art and decided to adapt the idea to making a fairy wand. 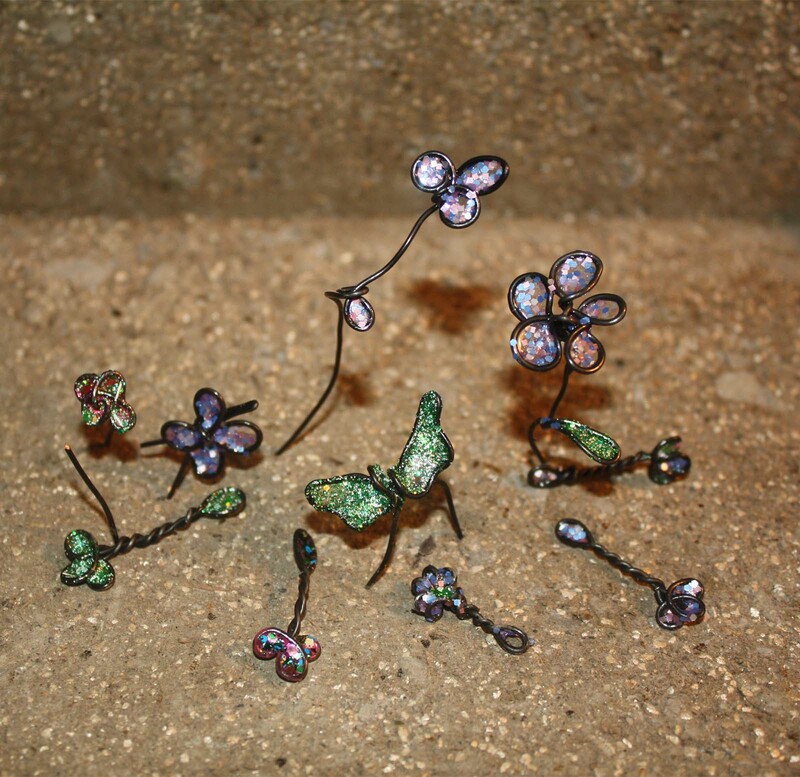 That went ok so I tried a few other things… flowers, a butterfly, and a set of fairy wings. 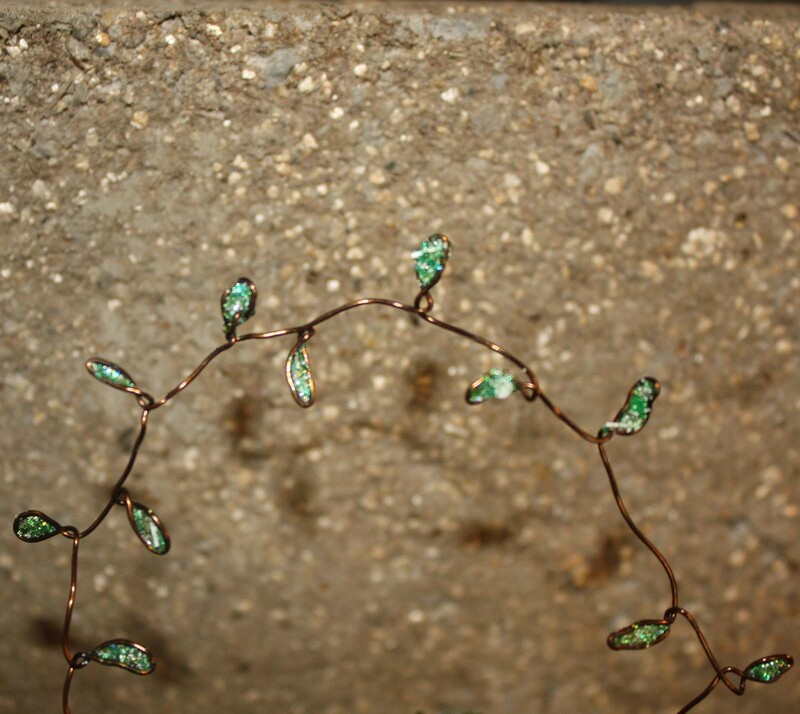 Then, having seen and admired twisted wire trees and leafy wire garlands on a fairy garden supplies website I went ahead and tried making my own. And learned a few things along the way. 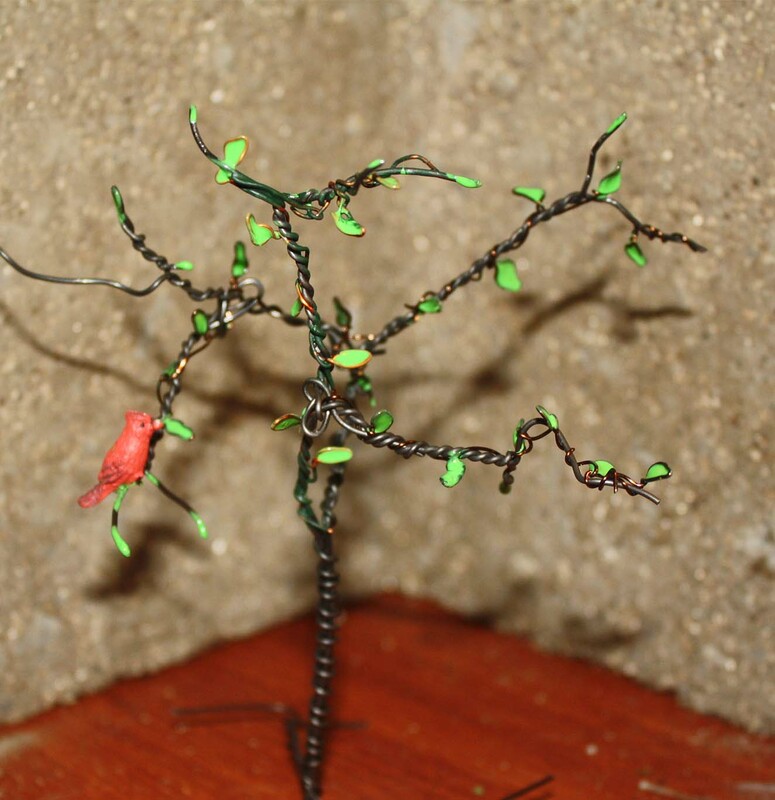 If you try this tree start with an even number of wire pieces (I used 19 gauge black craft wire), at least eight to have sufficient wire for making the ‘legs’ or roots at the bottom and a good number of branches. 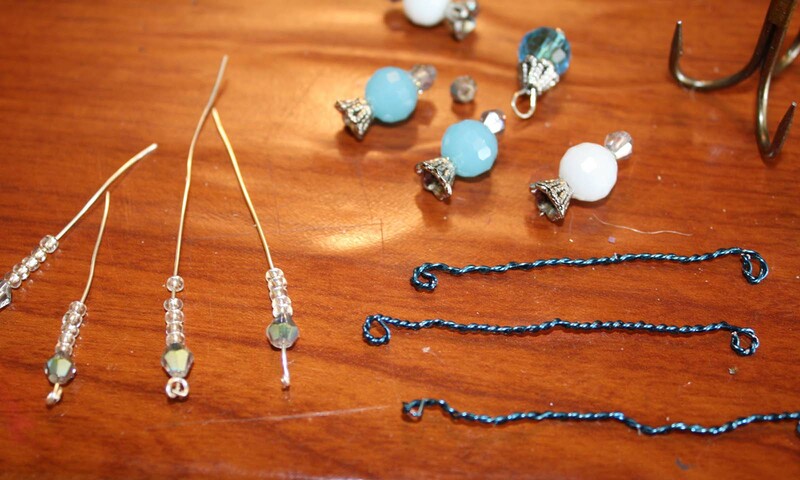 For the leaves a thin beading wire is easy to work with and comes in many colors. I made a leafy wire garland and added it to the tree . The basic technique for all of these projects is a simple loop. After you have a loop give it a couple of twists to keep its shape. To make the loop shape more leaf like insert a round object into the loop and then pinch the outer end of the loop with a pair of pliers. Brush the leaf or flower petal area with nail polish. This works somewhat the way bubbles on a bubble wand works. If the area to be painted is small enough try to spread the brush out to cover the whole area and gently let the polish fill the hole. For larger areas start the polish in the tightest area holding the piece so that the polish clan flow down across the rest of the area. 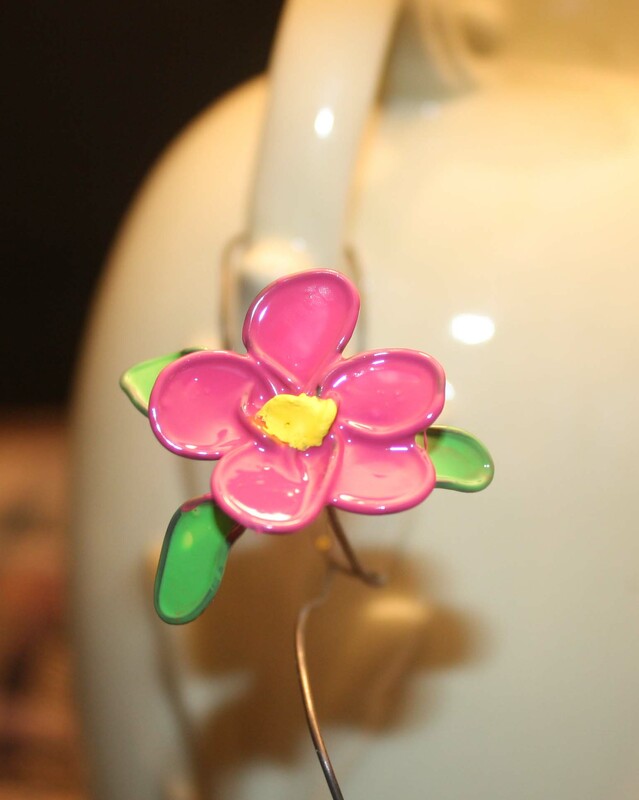 For the flower in the first picture I used a bit of acrylic paint for the flower center.